The Wire Mobile File Cart features four swivel casters (wheels), making it easy to move between work-spaces to use anywhere it is needed. These mobile carts can be used in personal work-spaces, home offices, conference rooms, libraries or anywhere else storage and filing is needed as well as everywhere in between. 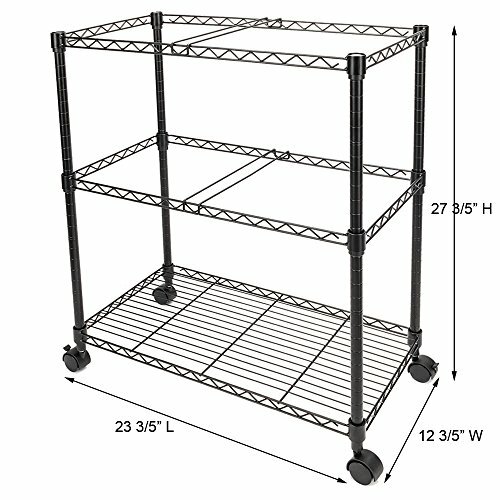 For additional convenience, these carts can fit under most work surfaces to provide space-saving storage and filing solutions. The durable design provides a long-lasting solution in offices, schools, home or a variety of other settings. This space-saving filing solution fits under most work surfaces and accommodates both letter and legal-size folders to suit a variety of needs. ANTI-RUST MATERIAL FOR LONG TIME USE: Made of durable, gleaming, chrome-plated stainless steel , sturdy and durable, simple but elegant appearance works in almost every house OR office decoration style. EASY MOVING: 4 nylon casters allow the serving cart to roll around easily; 2 brakes help to keep it in place as you need. ADJUSTABLE DURABLE SHELVES: Shelves can be adjusted in 1 inch increments, making it easy to store various size objects. Color: 2-Tier 23.6" x 12.6" x 27.6"